When I was in school, I made this all the time. It tasted good, was cheap and easy, and I had a vegetarian friend who often ate with me, and it’s vegetarian. The book this is from is out of print, but if you check it out on Amazon, you will see it has 122 reviews, most of them very favorable. It is written by the actor Dom Deluise and essentially represents the cooking of Italian-American immigrants, so those of us who are second - or in my case third - generation Italian-Americans will recognize and enjoy this food. This book has a lot of vegetarian recipes in it, presumably because Italian-American Roman Catholics were stuck for so many years with meatless Fridays. This is thick, not soupy. 1 cup uncooked DeCecco elbow macaroni (I specify DeCecco because the elbows are very small.) If you prefer to weigh it, use 6 ounces. Cook macaroni slightly underdone and set aside. Put the oil in a saucepan, add the garlic, turn on the heat, and cook the garlic gently in the oil until just starting to color. Add the tomato sauce. Fill the tomato sauce can with water, and add it to the tomato sauce in the pan. Cook this for 10 minutes. Add the beans, stir gently, and simmer on a low flame for 10 minutes more. Add the cooked pasta to the pan. Stir gently. If it gets too thick, add a little more water – but I don’t usually have this problem. Turn off the heat, and add chopped parsley. Sprinkle with grated cheese. Serve immediately or else the pasta will absorb the liquid. Just discovered your blog, which is very enjoyable and has great and very classic recipes. 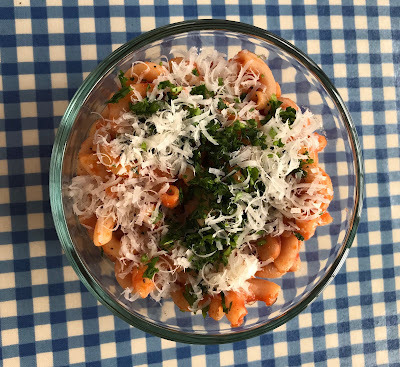 Since you are such a fan of the late Marcella Hazan (as am I), I am surprised you haven't included her recipe for pasta e fagiole, which to me is absolutely the best recipe for this dish. My 9 year old daughter, who is a very picky eater, told me she would eat Marcella's pasta e fagiole every day of the week if she could.